Note: The Really Right Stuff TVC-34 / TVC-34L Carbon Fiber Tripod has been replaced by the Really Right Stuff TFC/TVC-34/34L Mk2 Tripod. I'm on a continuous search for what I consider to be the ultimate tripod. A tripod is one of the most important accessories in my kit – perhaps too important to be considered an "accessory". Not terribly long ago, Really Right Stuff, designer and manufacturer of some of the best-functioning and highest-quality camera accessories available, sold only Gitzo brand full size tripods. There is a narrow selection of tripods that compare to the Gitzos, especially the carbon fiber models and the Gitzo GT3542LS Systematic Tripod has been my "ultimate" choice for years. It performs amazingly and is unmatched by anything else I've tried ... until now. I said "Not terribly long ago" because ... RRS now designs and produces a wide range of their own tripod models. As expected, these tripods are aesthetically beautiful and they function incredibly well. For especially the latter reason, fully evaluating a Really Right Stuff tripod has been on my to-do list for some time now. With a range of RRS tripod models available, my first task was to select the model to evaluate and selecting one that had the most staying potential was my goal. 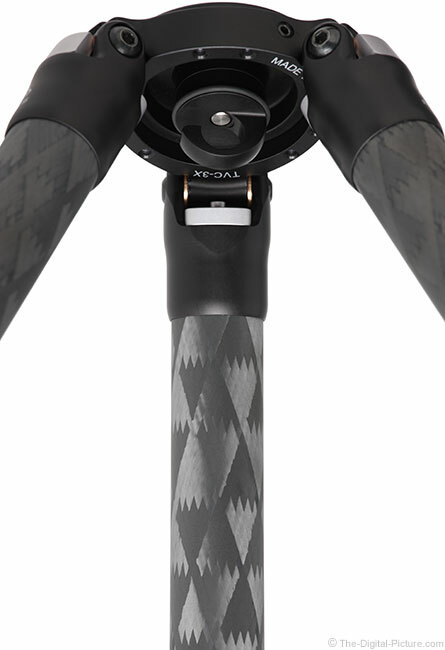 First, I wanted a carbon fiber leg model (vs. aluminum). 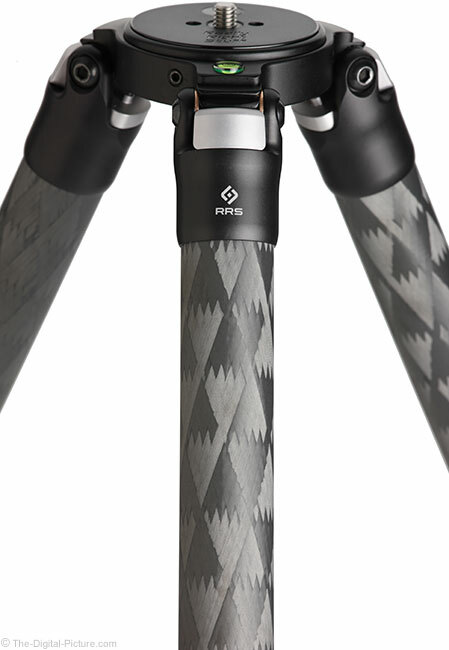 Carbon fiber tripods are typically lighter than equally-weight-rated aluminum models and at least as important is that carbon fiber better dampens vibrations. Carbon fiber does not transfer heat as easily as aluminum, making carbon fiber much more skin-friendly while photographing in temperature extremes. Aluminum dents and bends, but carbon fiber breaks. Neither is good and the latter is less likely, but dented and/or bent may remain usable. Also for consideration is that aluminum is susceptible to corrosion – especially if used in/around salt water. Since RRS currently makes only carbon fiber full-size tripods, this part of the selection process was easy. With more than one option available, finding the RRS tripod with the right combination of size, weight and strength is much more challenging. Fortunately, the decision process was not terribly difficult for me. The Gitzo 3-Series models have been my choice and RRS' 3-Series models align nicely with the Gitzo's specs. So, a 3-Series model was the choice. Next up is the number of leg section selection. More leg sections equate to more locks (to buy and to adjust) and a thinner bottom leg diameter, resulting in potentially less stability. The quality leg locks and sections being made today have greatly equalized the 3 vs. 4 leg sections stability differentiator, though the price and adjustment factors remain for the RRS tripods. The advantage of the 4-section models is a shorter retracted length, including a shorter height when set up with all 4 sections retracted. I travel with my tripods and the reduced minimum folded length is very helpful to me. So, I once again went with a 4 leg section model. My decision tree was down to the Really Right Stuff TVC-34 ("T"ripod, "V"ersa, Series "3", "4" sections per leg) or TVC-34L with the "L" referring to long. The long model means longer individual leg sections which equate to slightly more retracted length, a much longer extended length, slightly more weight and a bit more cost. The financial cost difference and, more importantly, the specs vs. benefits analysis of the two RRS tripods was a bit challenging for me. The smaller RRS tripod is most similar to my Gitzo tripod and also the latest-current Gitzo GT3543LS. In Gitzo's line, I have not been willing to carry the additional .7 lbs (318g) required to step up to the next-longer model. I'm 6' (1.83m) and the Gitzo GT3542LS is long enough for most of my needs. But, there are times when I could use some more length. Shooting the night sky is one of those. Shooting with the tripod positioned below me, such as in a stream, is another. And, getting higher over a composition is one more example. The RRS long model is not as long as the Gitzo XLS (it adds 20"/51 cm extended and 5.4"/13.7 cm retracted) and I decided that the RRS's extra 10" (25.4 cm) of height was worth the additional 3.3" (8.4 cm) retracted length and .3 lbs (136g) of weight. The Really Right Stuff TVC-34L adds 11.1" (28.2 cm) to what I've been using, but the weight penalty is reduced to .4 lbs (182g) and the retracted length increase is 1.8" (4.6cm). The height difference is very substantial and quite useful. The only noticeable downside to the longer model is that the percentage of the time that I simply fully extend all leg sections and tighten the locks is now very low. Making sure that one of the sections on each leg is not fully, but equally extended takes slightly more time. Big & Thin carbon fiber legs: With a large outer diameter and wall thickness of only 0.04", our carbon fiber tubes far surpass the competition in strength-to-weight ratio. CNC Machining: Computer Numerical Controlled (CNC) milling machines precisely sculpt parts out of solid metal affording excellent control in the design, fit and finish of every metal part found on an RRS tripod. Other tripod manufacturers employ mold casting to mass produce metal parts, resulting in lower strength/quality pieces. Anodizing vs Powder Coating: Anodizing produces surface protection embedded into the metal, yielding superior wear and corrosion resistance versus a superficial coating. Overall, this tripod works brilliantly and I can find nothing relevant to complain about. As I mentioned, the Gitzo GT3542LS is my current primary tripod and the very similar GT3543LS is the current version of that model. These are the two tripods I've found most worthy of comparison to the RRS TVC-34L. While I'm going to share some differences in an attempt to help you decide which of these tripods is best for you, it must be kept in mind that these are three of the best tripods available and the differences between them are very slight. There can be no big victory claims made here – it is hard to go wrong with a decision for any of these. The Gitzo tripods have a slightly higher weight rating, but ... I can hang while bouncing from all of them set up on a smooth epoxy-coated floor, so strength for most normal uses is fully covered. The RRS TVC-34 is similar in height to the Gitzo models I'm comparing, but I consider having the longer TVC-34L model an advantage for RRS. Though the minimum height specs all appear similar, the Gitzo actually goes down to about 2.75" (7 cm) or about 1" (2.54 cm) lower than the TVC-34L. The RRS TVC-34 retracts to a slightly shorter length than the Gitzos and the TVC-34L to slightly longer (as expected). The RRS TVC-34 is similar in weight to the Gitzos and the TVC-34L weighs slightly more (again, as expected). The amount of vibration shown in a tripod system matters a lot to me as the purpose of a tripod is to steady a camera and lens. A tripod that dampens vibrations quickly and effectively means that I will get more sharp photos and am potentially able to shoot in less favorable conditions (such as wind) than otherwise possible. As I also mentioned earlier in the review, I selected the long version of the RRS tripod, so my vibration comparison between the two brands is not exactly apples-to-apples. However, to avoid as much disadvantage to the longer tripod as possible, I adjusted all of the RRS TVC-34L leg sections to match the fully extended Gitzo leg sections (potentially even giving the RRS model an advantage). With the Gitzo fully extended, the RRS matching it in height and an Arca-Swiss Z1 Ball Head on each, I alternately mounted a Canon EF 600 f/4 L IS II USM Lens. What I saw was that the Gitzo GT3542LS stopped vibrations (caused by taps on the camera body) about a second faster than the RRS TVC-34L did (taking roughly 3 seconds) and the RRS tripod eliminated vibrations roughly a second faster than I remember the identical Gitzo GT3543LS setup taking. While I could see a difference, the difference we are talking about here is slight and all three perform very impressively. 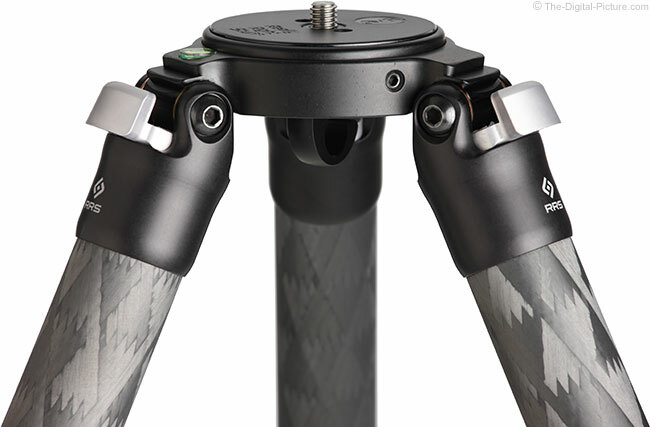 All three of these tripods feature quick-release twist legs locks. Twist locks are quiet to set up and all compared lock down very tightly. The "quick-release" feature is especially important to me, allowing for fast set up and tear down that can make the difference between getting or not getting a photo and also in the volume of photos captured. A difference is that the Gitzo GT3542LS leg locks are easier to loosen than the RRS leg locks (though more break-in may change this behavior) and the GT3543LS legs locks are the hardest to turn of the three. But, the GT3543LS leg locks feature an O-ring seal that the others lack. The RRS legs are thicker in diameter (see the table above) and the leg locks are correspondingly fatter. My medium-size hands prefer the smaller diameter. I very frequently carry my tripod in my hand and I typically grasp it by one leg where the leg meets the chassis as this is a good balance point. The RRS, with its smoothly-rounded machined surfaces, is considerably more comfortable to carry than the Gitzo tripods. The narrower RRS chassis is one piece and requires a hex key wrench to swap out its top plate. 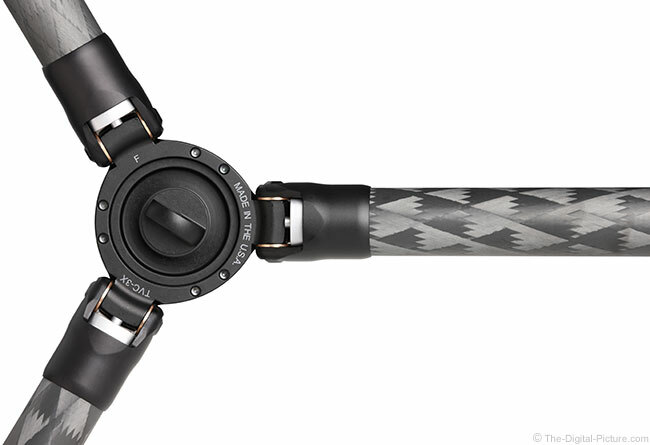 The Gitzo chassis is a split ring-type design with a captive thumbscrew available for easy in-the-field change-outs. I don't remove my top plate, so for me, the RRS design is slightly better, though I wouldn't call this a decision factor for me. A nice advantage the Gitzo GT3543LS chassis enjoys is the Easy Link Attachment System, allowing other items to be attached directly to the tripod. 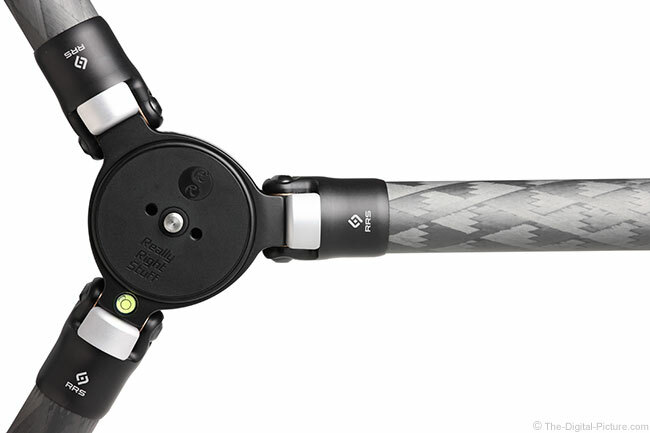 The RRS leg angle adjustment friction is adjustable with a commonly-found hex key wrench while Gitzo uses a harder-to-find star-shaped wrench. The RRS angle stops are a nicer design, though the Gitzo locks work fine. 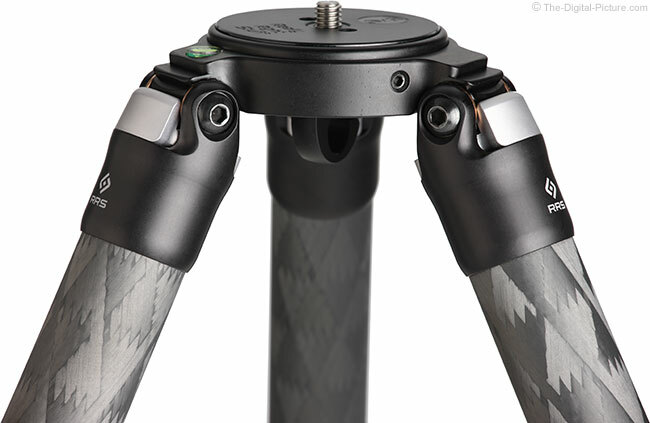 The Gitzo legs fold to a much higher negative angle (they fold past straight down) than the RRS legs, but ... I don't recall when that feature was an advantage and it can be a disadvantage when trying to fold the tripod. The RRS feet are larger and they better keep the leg locks out of the dirt when using the tripod in its widest-spread position. So, are RRS tripods better than Gitzo tripods? That is the question I set out to answer with this review. My conclusion is that the two are more equal than different in their basic functionality and I'm not going to declare a winner in this comparison. All of these tripods are awesome and it is hard to go wrong with a choice of any of them. If any of the differences mentioned matters to you, go with your preferred option. As I already own the Gitzo, I'm probably not going to pay the upgrade cost to move to the RRS tripod, but ... I likewise would stay with the RRS tripod if that is what I already owned. The decision would be considerably harder if I owned neither. Speaking relatively, the price tag on RRS products is rarely considered "low" and the RRS tripods are no different. The ultimate quality comes with a price. However, tripods are an item that many beginners upgrade over and over again until they reach the best available because, as they progress, they realize that the quality of the tripod matters. Buying the best makes a lot of sense and this tripod could easily be the last you buy. 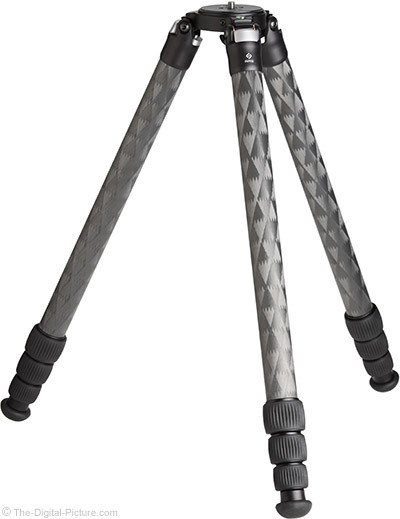 The reviewed tripod was obtained online/retail. The choice of tripod heads is similarly important to the choice of a tripod. I mentioned that I used Arca-Swiss Z1 Ball Heads for testing this tripod and these are currently my preferred heads. But, I swapped out the included clamps for Really Right Stuff B2 AS II Lever Release Clamps. These are the best quick release clamps I've used. 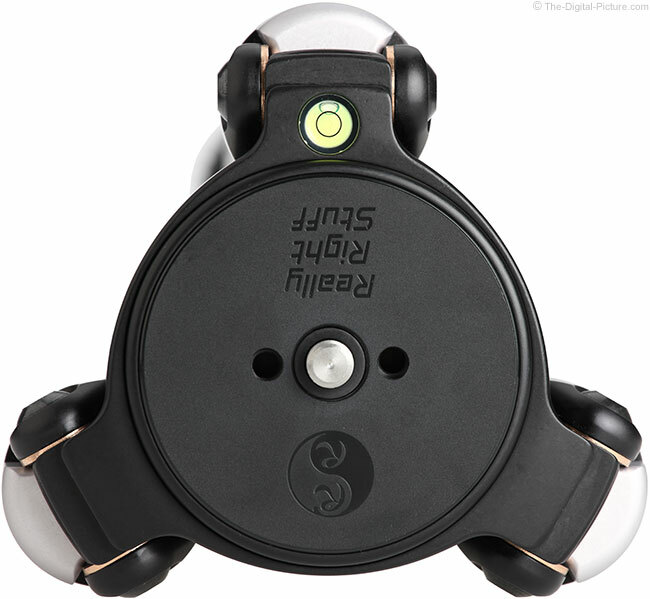 They are beautifully designed, they function very well and I trust them to hold onto very valuable gear. Never has one failed and I doubt one will ever let me down. That said, the Really Right Stuff BH-55 Ball Head is definitely worth considering for an all-RRS solution. This head shares the design and build principles found in the rest of Really Right Stuff's products. I've used the BH-55 and would have no reserve in making it my primary ball head. I had the pleasure of using the Really Right Stuff TVC-34L tripod on a recent 9-day photo trip to North and Middle Caicos (Turks and Caicos, British West Indies). While I like to evaluate new gear on such trips, with much at stake, I'm not willing to take a chance on an even slightly inferior product. Minimally, if I do not have full confidence in the item, I have a trustworthy backup readily available. After giving the TVC-34L a workout in the studio, and knowing the Really Right Stuff quality tradition, I had full confidence in making the TVC-34L my sole tripod for the expedition. The winds were extreme the entire week and I was very happy to have a great support under my camera. The tripod was coated in salt water residue by the end of the week and only a simple wipe-down was required to restore the TVC-34L to like-new condition. For those looking for a high quality tripod, the RRS lineup offers a full range of versatile, no-compromise, top-of-the-line, solutions. Definitely include them on your very short list. Out of the many RRS models available, the Really Right Stuff TVC-34L is my choice for general purpose use with the TVC-34 taking a close second place.